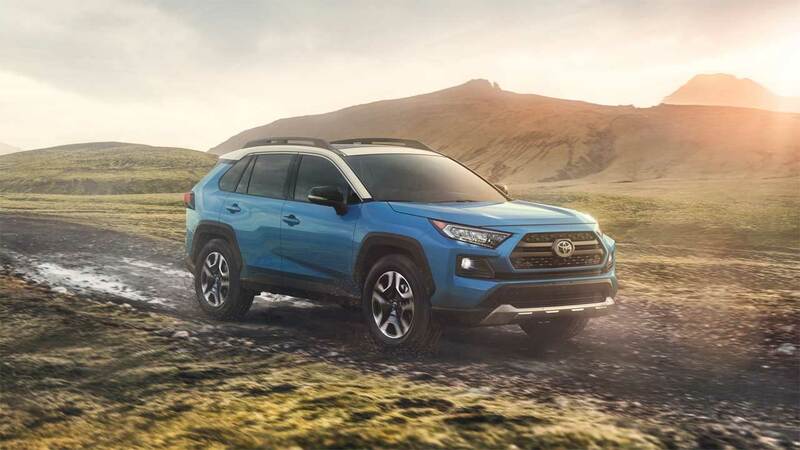 2019 RAV4Every day deserves more adventure. One unmistakable spirit, multiple distinct versions. RAV4 brings a new level of refinement that’s sure to impress wherever you go. 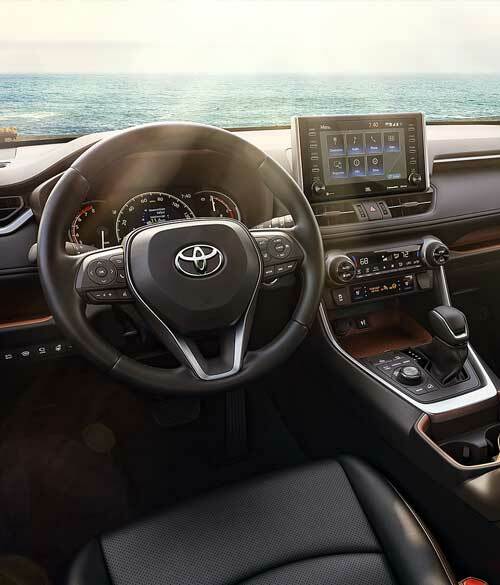 From endless entertainment to thoughtful convenience features, RAV4 is filled with technology that keeps up with you. 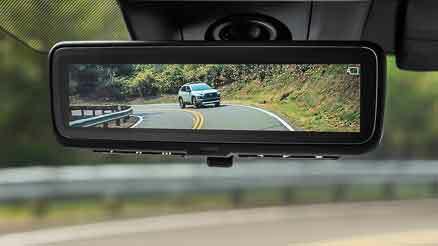 RAV4’s updated Toyota Safety Sense™ 2.0 (TSS 2.0) 37 plus Star Safety System™ work together to help protect you and your passengers from harm. Available Dynamic Torque Vectoring All-Wheel Drive (TV-AWD) improves responsiveness and stability by sending up to 50 percent of the power to the rear and then further distributing more power to the wheel that needs it. To boost fuel efficiency, Rear Driveline Disconnect will stop sending power to the rear when it isn’t necessary. 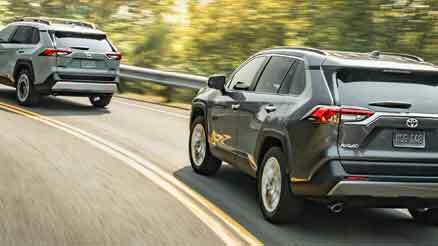 RAV4 now features standard Multi-terrain Select on All-Wheel Drive (AWD) models. Choose between three modes (Mud and Sand, Rock and Dirt, and Snow) for improved traction. When activated, the system can sense slippage and will regulate wheelspin by automatically adjusting the engine throttle, brakes and drive-force distribution—helping to maximize driving performance on different surfaces. Bring along more of what matters. 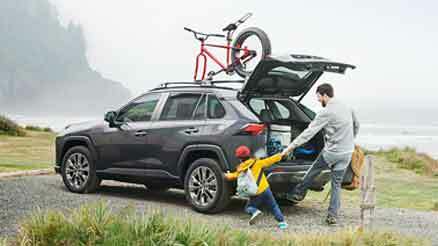 Standard RAV4 grades have the ability to tow up to 1500 lbs. Leave a lasting impression. Underneath the rear bumper, the dual chrome exhaust tips show off a powerful look when seen from behind. A rear spoiler and modern LED taillights deliver a distinctive appearance and finish off the design. 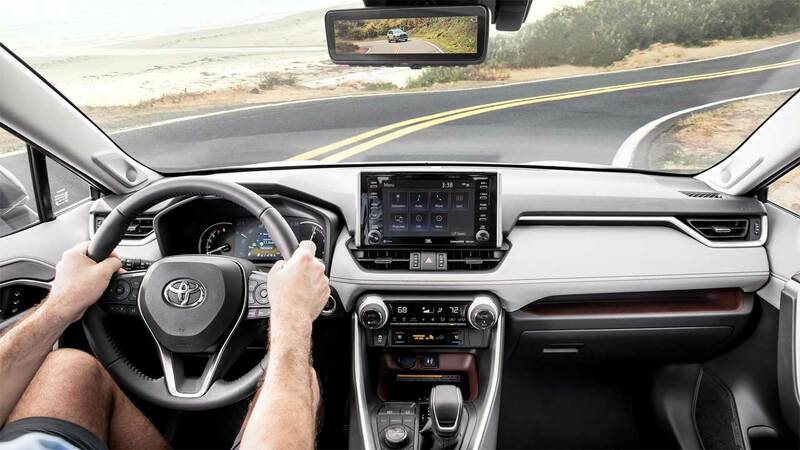 Instantly upgrade your connectivity and infotainment with RAV4’s new Entune 3.0 multimedia system. Wherever you go, you can always access the systems using the available 8-inch touch-screen. Connect your smartphone through standard Bluetooth® to make phone calls or stream music. Bring along a familiar face. Now with Apple CarPlay compatibility, you can use your compatible iPhone with RAV4's audio multimedia system to get directions, make calls, send and receive messages, and listen to music while staying focused on your commute. Stay connected to fun. Plug your smartphone or mobile device into one of up to five USB ports to power up. You can also place your device on the available Qi-compatible wireless smartphone charging pad found conveniently in the tray below the climate controls. Enhance the soundtrack to every adventure with RAV4’s available JBL w/Clari-Fi audio system. The next-gen system uses 800 watts of total power to drive 11 speakers in nine locations, including front horn tweeters and a subwoofer. Clari-Fi technology intelligently adjusts to every audio format, optimizing sound quality that turns every drive into an intimate concert. Powered to help you out. With a push of a button, the available power rear liftgate can open and close automatically. 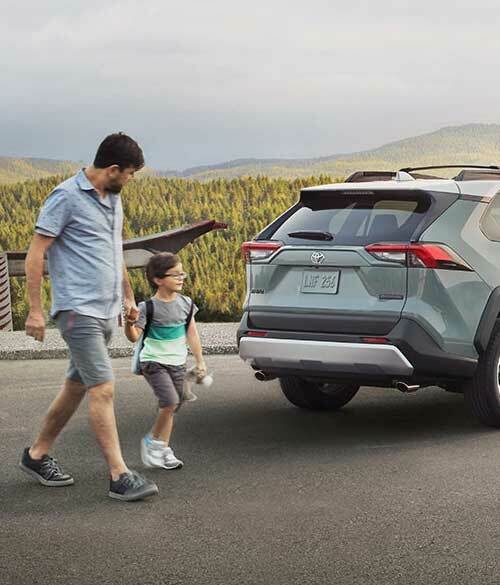 When your hands are full, the available hands-free power liftgate senses your Smart Key fob and opens automatically when you wave your foot under the rear bumper. Make every seat more comfortable. 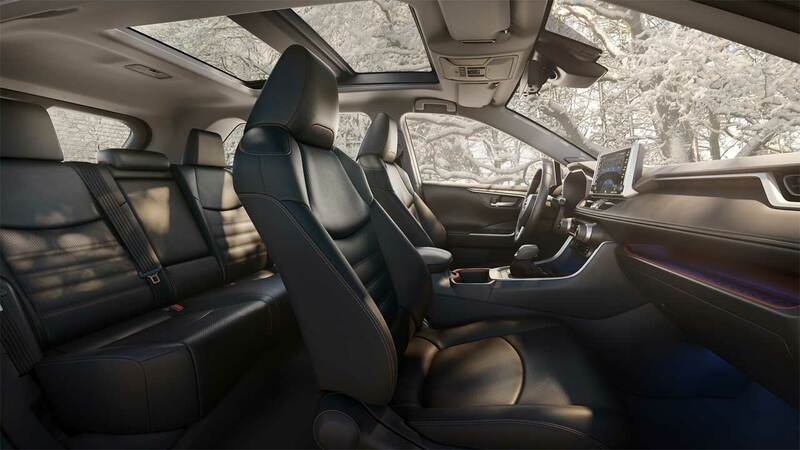 Available ventilated and heated front seats cool or warm up on demand, while available heated rear outboard seats can help keep rear passengers warm. Dial in the comfort. Front seat passengers can fine-tune the temperature to their liking. Rear vents found behind the center console get the air circulating and further help those in back get comfortable. Find a place for all your things. Below RAV4’s climate controls is a storage tray that can hold whatever’s in your pocket. A convenient shelf between the upper and lower dash gives you the perfect spot to place small items. Power your gear wherever you go. 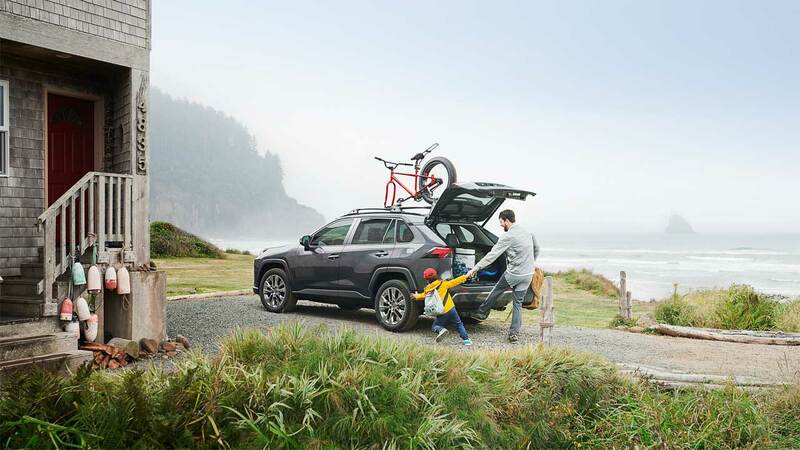 All you have to do is access the rear cargo area and plug into RAV4’s standard 12V/120W outlet to give you the charge you need to keep going. Adventure grade ups the power with an additional 120V/100W power outlet in the rear cargo area. RAV4's Road Sign Assist (RSA) helps keep you informed. 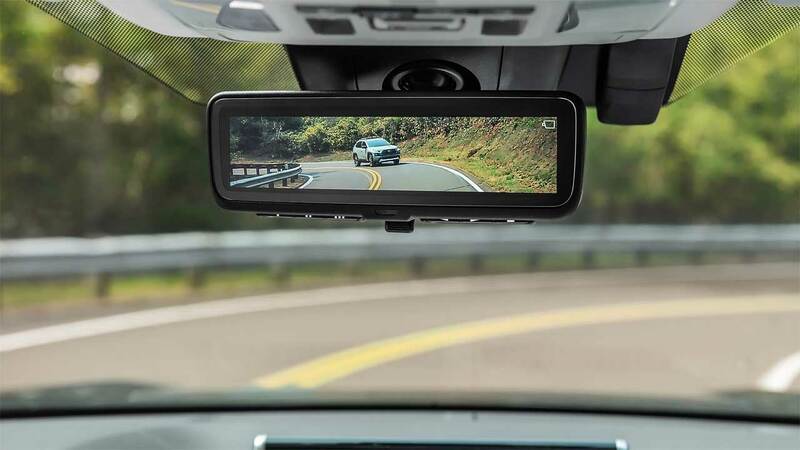 Using a forward-facing intelligent camera, Road Sign Assist is designed to detect speed limit signs, stop signs and yield signs, and displays them on the Multi-Information Display (MID). When the available Full-Speed Range Dynamic Radar Cruise Control (DRCC) is enabled and lane markers are detectable, Lane Tracing Assist (LTA) uses the lines on the road and preceding vehicles to help keep the vehicle centered while also displaying the vehicle’s position on the Multi-Information Display (MID) screen. The system was designed to reduce driver strain and increase convenience, and may benefit drivers most during traffic jams—but can be turned off using the MID. 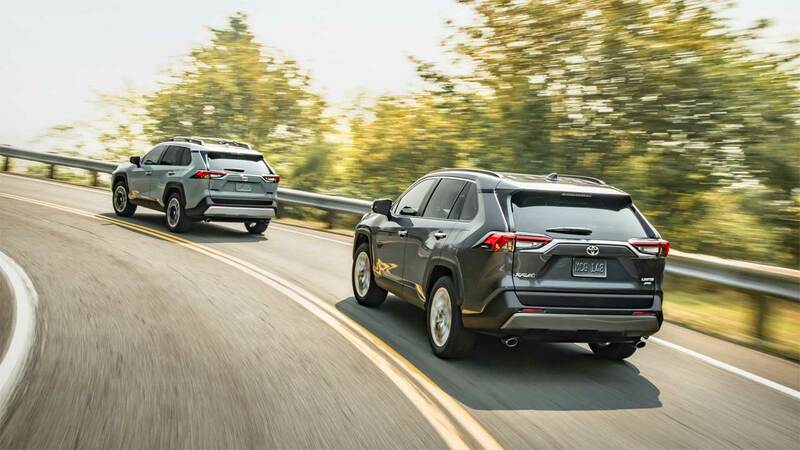 RAV4’s Pre-Collision System with Pedestrian Detection (PCS w/PD) helps keep the road safe by detecting a pedestrian under certain daytime conditions. If the system determines that the possibility of frontal collision with a pedestrian is high, it prompts the driver to take evasive action and brake by using an audio/visual alert. 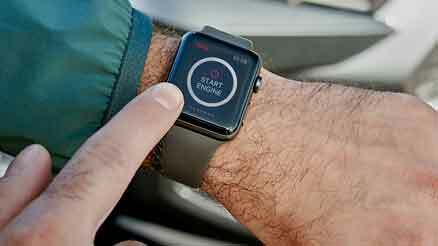 If the driver reacts and brakes, the system may use Brake Assist (BA) to provide additional brake force. If the driver doesn't react and brake and the system determines that the risk of collision is high, the system may automatically apply the brakes, reducing speed to help mitigate the impact or avoid the collision entirely, if possible. Intended for highway use and similar to “constant speed” cruise control, Full-Speed Range Dynamic Radar Cruise Control (DRCC) lets you drive at a preset speed. DRCC uses vehicle-to-vehicle distance control, which is designed to adjust your speed, to help you maintain a preset distance from vehicles ahead of you that are driving at a slower speed. DRCC uses a front-grille-mounted radar and an in-vehicle camera designed to detect vehicles and their distance. If a driver is traveling slower than you, or within your preset range, DRCC is designed to automatically slow your vehicle down without deactivating cruise control. If DRCC determines you need to slow down more, an audio and visual alert notifies you and brakes may be applied. When there’s no longer a vehicle driving slower than your preset speed in front of you, DRCC will then accelerate and regular cruise control will resume. By detecting visible lane markings or using Road Edge Detection, Lane Departure Alert with Steering Assist (LDA w/SA) issues both an audible alert and visual warning on the Multi-Information Display (MID) screen if an inadvertent lane departure is detected. 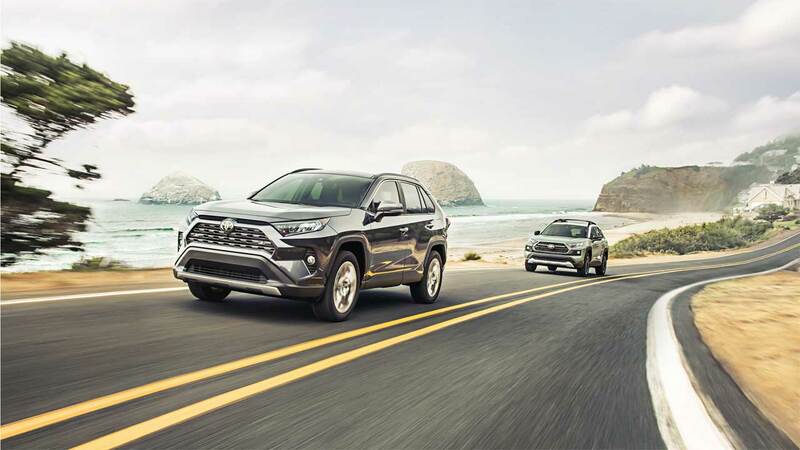 If the system determines that the driver is not taking corrective steering action, the Steering Assist function is designed to initiate and provide gentle corrective steering to help keep RAV4 in the lane. RAV4’s Automatic High Beams (AHB) are a safety system designed to help you see more clearly at night—without distracting other drivers. Designed to activate at speeds above 25 mph, AHB rely on an in-vehicle camera to help detect the headlights of oncoming vehicles and taillights of preceding vehicles, then automatically toggle between high and low beams accordingly to provide the appropriate amount of light. By using high beams more frequently, the system may allow earlier detection of pedestrians and obstacles. 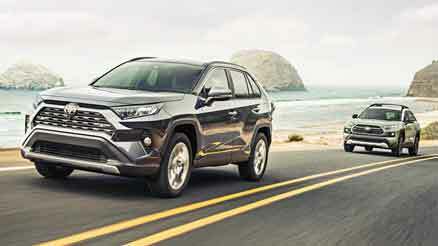 2019 RAV4 LE FWD 2.5L 4-Cyl. Interior Features: Climate control system with dust and pollen filter, Integrated backup camera with projected path, Analog speedometer, tachometer, coolant temperature and fuel gauges; 4.2-in. digital Multi-Information Display (MID) with customizable settings, odometer, tripmeters, clock and outside temperature; rear-passenger seatbelt indicators, fuel economy information, trip timer, shift-position and scheduled maintenance indicators, and warning messages, Five-passenger seating with fabric-trimmed seating surfaces, Fabric-trimmed front bucket seats; 6-way adjustable driver's seat; 4-way adjustable front passenger seat with seatback pocket, 60/40 split reclining fold-flat rear seat with center armrest and cup holders, Black carpet flooring with driver-side footrest, Urethane tilt/telescopic three-spoke steering wheel with controls for audio, Multi-Information Display (MID), Bluetooth® hands-free phone and voice-command, Dynamic Radar Cruise Control (DRCC), Lane Departure Alert (LDA) and Lane Tracing Assist (LTA), Turn signal stalk with headlight controls and one-touch three-blink lane-change turn signals, Wiper control stalk with front and rear window wiper controls, Shift lever with sequential mode, Soft-touch dash and armrests, with stitched dash accents, Black in-dash storage trays, Ash-gray-fabric-trimmed headliner, Black interior door handles, Remote keyless entry system with lock, unlock and panic functions, and remote illuminated entry, Power windows with auto up/down and jam protection in all positions, Rear liftgate window defogger, Power door locks with shift-linked automatic lock/unlock feature, Day/night rearview mirror, Overhead console with maplights, sunglasses storage and Safety Connect® button, Sun visors with illuminated vanity mirrors, Center console with covered storage compartment, two cup holders, drive mode, Electric Parking Brake (EPB) and automatic Brake Hold controls, and front storage tray, Passenger-side glove compartment, Height-adjustable rear cargo area deck board, One USB media port in front storage tray, One 12V/120W auxiliary power outlet in front instrument panel storage tray, and one 12V/120W auxiliary power outlet in second row, Front reading lights, overhead dome light and rear cargo area light, Front-row door panels with storage pockets and bottle holders, Eight total cup and bottle holders (four cup holders and four bottle holders), Automatic Electric Parking Brake (EPB) with Brake Hold feature. Exterior Features: 17-in. steel wheels with silver six-spoke wheel covers and 225/65R17 tires, Multi-LED headlights with Automatic High Beams (AHB), LED Daytime Running Lights (DRL), LED taillights and stop lights, Black hexagon-patterned-bar front grille, Color-keyed upper front bumper and black lower front bumper, overfenders and rear bumper, Power outside mirrors with folding feature, Color-keyed outside door handles, Low-profile black-painted roof rails, Aerodynamic underbody panels with vortex generators, front and rear wheel spats, and integrated rear spoiler, Privacy glass on all rear-side, quarter and liftgate windows, Dual chrome exhaust tips, Intermittent windshield wipers, Intermittent rear window wiper, Color-keyed roof-mounted shark-fin antenna. Multimedia: Entune™ 3.0 Audio — includes six speakers, 7-in. touch-screen, AM/FM, Scout® GPS Link compatible with up to 3-year trial, Siri® Eyes Free, Apple CarPlay® compatible, auxiliary port, USB media port (plus four additional USB charging ports on XLE and XLE Premium models), hands-free phone capability, advanced voice recognition and music streaming via Bluetooth® wireless technology. Toyota Connected Services — Safety Connect® with 3-year trial and Wi-Fi Connect Powered by Verizon with up to 2GB within 6-month trial. See toyota.com/entune for details. 2019 RAV4 LE AWD 2.5L 4-Cyl. 2019 RAV4 XLE FWD 2.5L 4-Cyl. Interior Features: Dual zone automatic climate control system with dust and pollen filter, and rear-seat vents, Integrated backup camera with projected path, Analog speedometer, tachometer, coolant temperature and fuel gauges; 4.2-in. digital Multi-Information Display (MID) with customizable settings, odometer, tripmeters, clock and outside temperature; rear-passenger seatbelt indicators, fuel economy information, trip timer, shift-position and scheduled maintenance indicators, and warning messages, Five-passenger seating with fabric-trimmed seating surfaces, Fabric-trimmed front bucket seats with embossed polygon-design seat inserts; 6-way adjustable driver's seat; 4-way adjustable front passenger seat with seatback pocket, 60/40 split reclining fold-flat rear seat with center armrest and cup holders, Black carpet flooring with driver-side footrest, Urethane tilt/telescopic three-spoke steering wheel with controls for audio, Multi-Information Display (MID), Bluetooth® hands-free phone and voice-command, Dynamic Radar Cruise Control (DRCC), Lane Departure Alert (LDA) and Lane Tracing Assist (LTA), Turn signal stalk with headlight controls and one-touch three-blink lane-change turn signals, Wiper control stalk with front and rear window wiper controls, Shift lever with sequential mode, Soft-touch dash and armrests, with stitched dash accents, Black in-dash storage trays, Ash-gray-fabric-trimmed headliner, Silver interior door handles, Smart Key System on front doors and liftgate with Push Button Start, remote keyless entry with lock, unlock and panic functions, and remote illuminated entry, Power windows with auto up/down and jam protection in all positions, Rear liftgate window defogger, Power door locks with shift-linked automatic lock/unlock feature, Day/night rearview mirror, Overhead console with maplights, sunglasses storage, Safety Connect® button and power tilt/slide moonroof controls, Sun visors with sliding extensions and illuminated vanity mirrors, Center console with covered storage compartment, two cup holders, drive mode, Electric Parking Brake (EPB) and automatic Brake Hold controls, and front storage tray, Passenger-side glove compartment, Height-adjustable rear cargo area deck board, Rear cargo area cover, Five USB ports — one USB media port in front storage tray, and four additional USB charging ports (two in front center console, and two rear-seat ports on the back of center console), One 12V/120W auxiliary power outlet in front instrument panel storage tray, and one 12V/120W auxiliary power outlet in cargo area, Front reading lights, overhead dome light and rear cargo area light, Front-row door panels with storage pockets and bottle holders, Eight total cup and bottle holders (four cup holders and four bottle holders), Automatic Electric Parking Brake (EPB) with Brake Hold feature. Exterior Features: 17-in. five-spoke silver alloy wheels with 225/65R17 tires, Multi-LED headlights with chrome bezels, Automatic High Beams (AHB) and auto on/off features, LED Daytime Running Lights (DRL), Integrated fog lights, LED taillights and stop lights, Black hexagon-patterned-bar front grille, Color-keyed upper front bumper and black lower front bumper, overfenders and rear bumper, Color-keyed heated power outside mirrors with turn signal and blind spot warning indicators, and folding feature, Color-keyed outside door handles with front-row touch-sensor lock/unlock feature, Power tilt/slide moonroof with one-touch open/close, Low-profile black-painted roof rails, Aerodynamic underbody panels with vortex generators, front and rear wheel spats, and integrated rear spoiler, Privacy glass on all rear-side, quarter and liftgate windows, Dual chrome exhaust tips, Variable intermittent windshield wipers, Intermittent rear window wiper, Color-keyed roof-mounted shark-fin antenna. 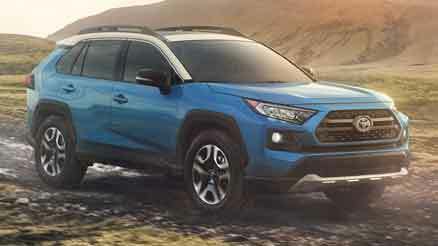 2019 RAV4 XLE AWD 2.5L 4-Cyl. Interior Features: Dual zone automatic climate control system with dust and pollen filter, and rear-seat vents, Integrated backup camera with projected path, Analog speedometer, tachometer, coolant temperature and fuel gauges; 4.2-in. digital Multi-Information Display (MID) with customizable settings, odometer, tripmeters, clock and outside temperature; rear-passenger seatbelt indicators, fuel economy information, trip timer, shift-position and scheduled maintenance indicators, and warning messages, Five-passenger seating with fabric-trimmed seating surfaces, Fabric-trimmed front bucket seats with embossed polygon-design seat inserts; 6-way adjustable driver's seat; 4-way adjustable front passenger seat with seatback pocket, 60/40 split reclining fold-flat rear seat with center armrest and cup holders, Black carpet flooring with driver-side footrest, Urethane tilt/telescopic three-spoke steering wheel with controls for audio, Multi-Information Display (MID), Bluetooth® hands-free phone and voice-command, Dynamic Radar Cruise Control (DRCC), Lane Departure Alert (LDA) and Lane Tracing Assist (LTA), Turn signal stalk with headlight controls and one-touch three-blink lane-change turn signals, Wiper control stalk with front and rear window wiper controls, Shift lever with sequential mode, Soft-touch dash and armrests, with stitched dash accents, Black in-dash storage trays, Ash-gray-fabric-trimmed headliner, Silver interior door handles, Smart Key System on front doors and liftgate with Push Button Start, remote keyless entry with lock, unlock and panic functions, and remote illuminated entry, Power windows with auto up/down and jam protection in all positions, Rear liftgate window defogger, Power door locks with shift-linked automatic lock/unlock feature, Day/night rearview mirror, Overhead console with maplights, sunglasses storage, Safety Connect® button and power tilt/slide moonroof controls, Sun visors with sliding extensions and illuminated vanity mirrors, Center console with covered storage compartment, two cup holders, drive mode, Multi-terrain Select, Electric Parking Brake (EPB) and automatic Brake Hold controls, and front storage tray, Passenger-side glove compartment, Height-adjustable rear cargo area deck board, Rear cargo area cover, Five USB ports — one USB media port in front storage tray, and four additional USB charging ports (two in front center console, and two rear-seat ports on the back of center console), One 12V/120W auxiliary power outlet in front instrument panel storage tray, and one 12V/120W auxiliary power outlet in cargo area, Front reading lights, overhead dome light and rear cargo area light, Front-row door panels with storage pockets and bottle holders, Eight total cup and bottle holders (four cup holders and four bottle holders), Automatic Electric Parking Brake (EPB) with Brake Hold feature. 2019 RAV4 XLE Premium FWD 2.5L 4-Cyl. Interior Features: Dual zone automatic climate control system with dust and pollen filter, front center vent flow controls and rear-seat vents, Integrated backup camera with projected path, Analog speedometer, tachometer, coolant temperature and fuel gauges; 4.2-in. digital Multi-Information Display (MID) with customizable settings, odometer, tripmeters, clock and outside temperature; rear-passenger seatbelt indicators, fuel economy information, trip timer, shift-position and scheduled maintenance indicators, and warning messages, Five-passenger seating with SofTex®-trimmed seating surfaces, SofTex®-trimmed front bucket seats; 8-way power-adjustable driver's seat with lumbar support; 4-way adjustable front passenger seat with seatback pocket, 60/40 split reclining fold-flat rear seat with center armrest and cup holders, Black carpet flooring with driver-side footrest, Leather-trimmed tilt/telescopic three-spoke steering wheel with silver accent and controls for audio, Multi-Information Display (MID), Bluetooth® hands-free phone and voice-command, Dynamic Radar Cruise Control (DRCC), Lane Departure Alert (LDA) and Lane Tracing Assist (LTA), Turn signal stalk with headlight controls and one-touch three-blink lane-change turn signals, Wiper control stalk with front and rear window wiper controls, Leather-trimmed shift lever with sequential mode, Soft-touch dash and armrests, with stitched dash and center console accents, and anti-slip interior door grip, Black anti-slip in-dash storage trays, Ash-gray-fabric-trimmed headliner, Silver interior door handles, Smart Key System on front doors and liftgate with Push Button Start, remote keyless entry with lock, unlock, panic and power liftgate with jam protection functions, and remote illuminated entry, Power windows with auto up/down and jam protection in all positions, Rear liftgate window defogger, Power door locks with shift-linked automatic lock/unlock feature, Day/night rearview mirror, Overhead console with maplights, sunglasses storage, Safety Connect® button and power tilt/slide moonroof controls, Sun visors with sliding extensions and illuminated vanity mirrors, Center console with covered storage compartment, two cup holders, drive mode, Electric Parking Brake (EPB) and automatic Brake Hold controls, and front storage tray, Passenger-side glove compartment, Height-adjustable rear cargo area deck board, Rear cargo area cover, Five USB ports — one USB media port in front storage tray, and four additional USB charging ports (two in front center console, and two rear-seat ports on the back of center console), One 12V/120W auxiliary power outlet in front instrument panel storage tray, and one 12V/120W auxiliary power outlet in cargo area, Front reading lights, overhead dome light and rear cargo area light, Front-row door panels with storage pockets and bottle holders, Eight total cup and bottle holders (four cup holders and four bottle holders), Automatic Electric Parking Brake (EPB) with Brake Hold feature. Exterior Features: 19-in. multi-spoke super chrome-finished alloy wheels with 235/55R19 tires, Multi-LED headlights with chrome bezels, Automatic High Beams (AHB) and auto on/off features, LED Daytime Running Lights (DRL), Integrated fog lights, LED taillights and stop lights, Black hexagon-patterned-bar front grille, Color-keyed upper front bumper and black lower front bumper, overfenders and rear bumper, Color-keyed heated power outside mirrors with turn signal and blind spot warning indicators, and folding feature, Color-keyed outside door handles with front-row touch-sensor lock/unlock feature, Power tilt/slide moonroof with one-touch open/close, Low-profile black-painted roof rails, Height-adjustable power liftgate with jam protection, Aerodynamic underbody panels with vortex generators, front and rear wheel spats, and integrated rear spoiler, Privacy glass on all rear-side, quarter and liftgate windows, Dual chrome exhaust tips, Variable intermittent windshield wipers, Intermittent rear window wiper, Color-keyed roof-mounted shark-fin antenna. 2019 RAV4 XLE Premium AWD 2.5L 4-Cyl. Interior Features: Dual zone automatic climate control system with dust and pollen filter, front center vent flow controls and rear-seat vents, Integrated backup camera with projected path, Analog speedometer, tachometer, coolant temperature and fuel gauges; 4.2-in. digital Multi-Information Display (MID) with customizable settings, odometer, tripmeters, clock and outside temperature; rear-passenger seatbelt indicators, fuel economy information, trip timer, shift-position and scheduled maintenance indicators, and warning messages, Five-passenger seating with SofTex®-trimmed seating surfaces, SofTex®-trimmed front bucket seats; 8-way power-adjustable driver's seat with lumbar support; 4-way adjustable front passenger seat with seatback pocket, 60/40 split reclining fold-flat rear seat with center armrest and cup holders, Black carpet flooring with driver-side footrest, Leather-trimmed tilt/telescopic three-spoke steering wheel with silver accent and controls for audio, Multi-Information Display (MID), Bluetooth® hands-free phone and voice-command, Dynamic Radar Cruise Control (DRCC), Lane Departure Alert (LDA) and Lane Tracing Assist (LTA), Turn signal stalk with headlight controls and one-touch three-blink lane-change turn signals, Wiper control stalk with front and rear window wiper controls, Leather-trimmed shift lever with sequential mode, Soft-touch dash and armrests, with stitched dash and center console accents, and anti-slip interior door grip, Black anti-slip in-dash storage trays, Ash-gray-fabric-trimmed headliner, Silver interior door handles, Smart Key System on front doors and liftgate with Push Button Start, remote keyless entry with lock, unlock, panic and power liftgate with jam protection functions, and remote illuminated entry, Power windows with auto up/down and jam protection in all positions, Rear liftgate window defogger, Power door locks with shift-linked automatic lock/unlock feature, Day/night rearview mirror, Overhead console with maplights, sunglasses storage, Safety Connect® button and power tilt/slide moonroof controls, Sun visors with sliding extensions and illuminated vanity mirrors, Center console with covered storage compartment, two cup holders, drive mode, Multi-terrain Select, Electric Parking Brake (EPB) and automatic Brake Hold controls, and front storage tray, Passenger-side glove compartment, Height-adjustable rear cargo area deck board, Rear cargo area cover, Five USB ports — one USB media port in front storage tray, and four additional USB charging ports (two in front center console, and two rear-seat ports on the back of center console), One 12V/120W auxiliary power outlet in front instrument panel storage tray, and one 12V/120W auxiliary power outlet in cargo area, Front reading lights, overhead dome light and rear cargo area light, Front-row door panels with storage pockets and bottle holders, Eight total cup and bottle holders (four cup holders and four bottle holders), Automatic Electric Parking Brake (EPB) with Brake Hold feature. 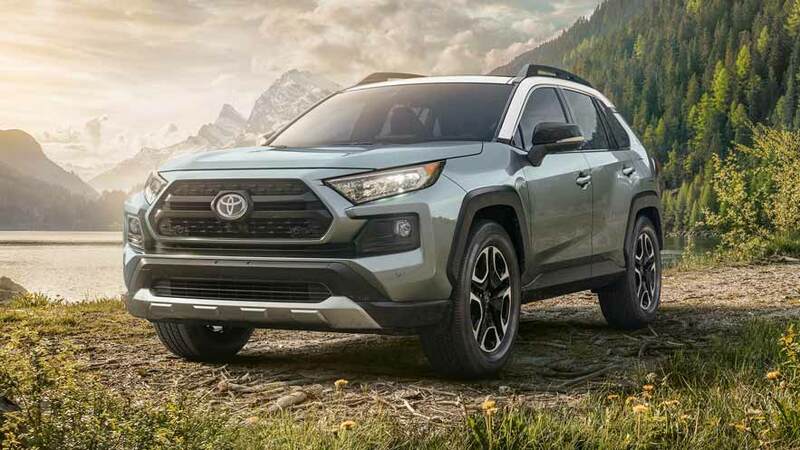 2019 RAV4 Adventure AWD 2.5L 4-Cyl. Interior Features: Dual zone automatic climate control system with dust and pollen filter, front center vent flow controls and rear-seat vents, Integrated panoramic backup camera with dynamic gridlines, Digital speedometer and instrumentation with analog tachometer, coolant temperature and fuel gauges; 7-in. digital Multi-Information Display (MID) with customizable settings, odometer, tripmeters, clock and outside temperature; rear-passenger seatbelt indicators, fuel economy information, trip timer, shift-position and scheduled maintenance indicators, and warning messages, Five-passenger seating with SofTex®-trimmed seating surfaces, SofTex®-trimmed front bucket seats with orange accents and stitching, and embossed seat inserts; 8-way power-adjustable driver's seat with lumbar support; 4-way adjustable front passenger seat with seatback pocket, 60/40 split reclining fold-flat rear seat with center armrest and cup holders, Black carpet flooring with driver-side footrest, Urethane tilt/telescopic three-spoke steering wheel with controls for audio, Multi-Information Display (MID), Bluetooth® hands-free phone and voice-command, Dynamic Radar Cruise Control (DRCC), Lane Departure Alert (LDA) and Lane Tracing Assist (LTA), Turn signal stalk with headlight controls and one-touch three-blink lane-change turn signals, Wiper control stalk with front and rear window wiper controls, Shift lever with sequential mode, Soft-touch dash, door and armrests with stitched dash, door and center console accents, and anti-slip interior door grip, Orange-accented interior, including orange stitching on dash, doors and seat; and orange cup holder trim and anti-slip in-dash storage trays, Ash-gray-fabric-trimmed headliner, Silver interior door handles, Smart Key System on front doors and liftgate with Push Button Start, remote keyless entry with lock, unlock, panic and power liftgate with jam protection functions, and remote illuminated entry, Power windows with auto up/down and jam protection in all positions, Rear liftgate window defogger, Power door locks with shift-linked automatic lock/unlock feature, Day/night rearview mirror, Overhead console with maplights, sunglasses storage and Safety Connect® button, Sun visors with sliding extensions and illuminated vanity mirrors, Center console with covered storage compartment, two cup holders, drive mode, Multi-terrain Select, Electric Parking Brake (EPB) and automatic Brake Hold controls, and front storage tray, Passenger-side glove compartment, Height-adjustable rear cargo area deck board, Rear cargo area cover, Rear cargo area deckside-mounted storage net, Five USB ports — one USB media port in front storage tray, and four additional USB charging ports (two in front center console, and two rear-seat ports on the back of center console), One 12V/120W auxiliary power outlet in front instrument panel storage tray, and one 12V/120W auxiliary power outlet in cargo area, One 120V/100W deck-mounted AC power outlet, Front reading lights, overhead dome light and rear cargo area light, Front-row door panels with storage pockets and bottle holders, Eight total cup and bottle holders (four cup holders and four bottle holders), Automatic Electric Parking Brake (EPB) with Brake Hold feature. Exterior Features: 19-in. split five-spoke alloy wheels with matte-black accents and 235/55R19 tires, Multi-LED headlights with chrome bezels, Automatic High Beams (AHB) and auto on/off features, LED Daytime Running Lights (DRL), Integrated fog lights, LED taillights and stop lights, Unique split-bar front upper grille, Unique color-keyed upper and black lower front bumper with silver valance, larger black overfenders and black rear bumper with silver insert, Black RAV4 and Adventure badging, Color-keyed heated power outside mirrors with turn signal and blind spot warning indicators, and folding feature, Color-keyed outside door handles with front-row touch-sensor lock/unlock feature, Unique Adventure grade roof rails, Height-adjustable power liftgate with jam protection, Active grille shutters, Privacy glass on all rear-side, quarter and liftgate windows, Dual chrome exhaust tips, Variable intermittent windshield wipers, Intermittent rear window wiper, Color-keyed roof-mounted shark-fin antenna. Multimedia: Entune™ 3.0 Audio Plus — includes six speakers, 8-in. touch-screen, AM/FM/HD Radio™, auxiliary port, USB media port, four USB charging ports, advanced voice recognition, hands-free phone capability and music streaming via Bluetooth® wireless technology, Scout® GPS Link compatible with up to 3-year trial, Siri® Eyes Free, Apple CarPlay® compatible, SiriusXM® Satellite Radio with 3-month All Access trial. Toyota Connected Services — Safety Connect® with 3-year trial, Service Connect with 3-year trial, Remote Connect with 6-month trial and Wi-Fi Connect Powered by Verizon with up to 2GB within 6-month trial. See toyota.com/entune for details. 2019 RAV4 Limited FWD 2.5L 4-Cyl. Interior Features: Dual zone automatic climate control system with dust and pollen filter, front center vent flow controls and rear-seat vents, Integrated panoramic backup camera with dynamic gridlines, Digital speedometer and instrumentation with analog tachometer, coolant temperature and fuel gauges; 7-in. digital Multi-Information Display (MID) with customizable settings, odometer, tripmeters, clock and outside temperature; rear-passenger seatbelt indicators, fuel economy information, trip timer, shift-position and scheduled maintenance indicators, and warning messages, Five-passenger seating with SofTex®-trimmed seating surfaces, Fabric-trimmed front bucket seats; 6-way adjustable driver's seat; 4-way adjustable front passenger seat with seatback pocket, SofTex®-trimmed heated front bucket seats; 8-way power-adjustable driver's seat with two-position memory function and lumbar support; 4-way adjustable front passenger seat with seatback pocket, 60/40 split reclining fold-flat rear seat with center armrest and cup holders, Heated front seats, Black carpet flooring with driver-side footrest, Leather-trimmed tilt/telescopic three-spoke steering wheel with silver accent and controls for audio, Multi-Information Display (MID), Bluetooth® hands-free phone and voice-command, Dynamic Radar Cruise Control (DRCC), Lane Departure Alert (LDA) and Lane Tracing Assist (LTA), Turn signal stalk with headlight controls and one-touch three-blink lane-change turn signals, Wiper control stalk with front and rear window wiper controls, Leather-trimmed shift lever with sequential mode, Soft-touch dash, door and armrests with stitched dash, door and center console accents, and anti-slip interior door grip, Dark-brown-accented interior, including dark-brown dash, door and seat stitching; and dark-brown cup holder trim and anti-slip in-dash storage trays with blue ambient lighting, Ash-gray-fabric-trimmed headliner, Silver interior door handles, Smart Key System on front doors and liftgate with Push Button Start, remote keyless entry with lock, unlock, panic and power liftgate with jam protection functions, and remote illuminated entry, Power windows with auto up/down and jam protection in all positions, Rear liftgate window defogger, Power door locks with shift-linked automatic lock/unlock feature, Digital rearview mirror with HomeLink® universal transceiver, Overhead console with maplights, sunglasses storage, Safety Connect® button and power tilt/slide moonroof controls, Sun visors with sliding extensions and illuminated vanity mirrors, Center console with covered storage compartment, two cup holders, drive mode, Electric Parking Brake (EPB) and automatic Brake Hold controls, and front storage tray, Passenger-side glove compartment, Height-adjustable rear cargo area deck board, Rear cargo area cover, Rear cargo area deckside-mounted storage net, Five USB ports — one USB media port in front storage tray, and four additional USB charging ports (two in front center console, and two rear-seat ports on the back of center console), One 12V/120W auxiliary power outlet in front instrument panel storage tray, and one 12V/120W auxiliary power outlet in cargo area, Front reading lights, overhead dome light and rear cargo area light, Blue ambient illumination for in-dash shelves, center console cup holders and in-front footwells, Front-row door panels with storage pockets and bottle holders, Eight total cup and bottle holders (four cup holders and four bottle holders), Automatic Electric Parking Brake (EPB) with Brake Hold feature. Exterior Features: 19-in. multi-spoke super chrome-finished alloy wheels with 235/55R19 tires, Multi-LED headlights with chrome bezels, Automatic High Beams (AHB) and auto on/off features, LED Daytime Running Lights (DRL), Integrated fog lights, LED taillights and stop lights, Dark Gray metallic-colored hexagon-patterned-bar front grille, Color-keyed upper bumper; black lower front bumper with silver valance and black overfenders; and rear bumper with metallic gray insert, Color-keyed heated power outside mirrors with turn signal and blind spot warning indicators, and folding feature, Puddle lights, Chrome-accented color-keyed outside door handles with front-row touch-sensor lock/unlock feature, Power tilt/slide moonroof with one-touch open/close, Low-profile black-painted roof rails, Height-adjustable power liftgate with jam protection , Active grille shutters, Privacy glass on all rear-side, quarter and liftgate windows, Dual chrome exhaust tips, Variable intermittent windshield wipers, Intermittent rear window wiper, Color-keyed roof-mounted shark-fin antenna. Multimedia: Entune™ 3.0 Premium Audio with Dynamic Navigation — includes six speakers, 8-in. touch-screen, AM/FM/HD Radio™, auxiliary port, USB media port, four USB charging ports, Dynamic Navigation with up to 3-year trial, Dynamic POI Search, Dynamic Voice Recognition, hands-free phone capability and music streaming via Bluetooth® wireless technology, Siri® Eyes Free, Apple CarPlay® compatible, SiriusXM® Satellite Radio with 3-month All Access trial. 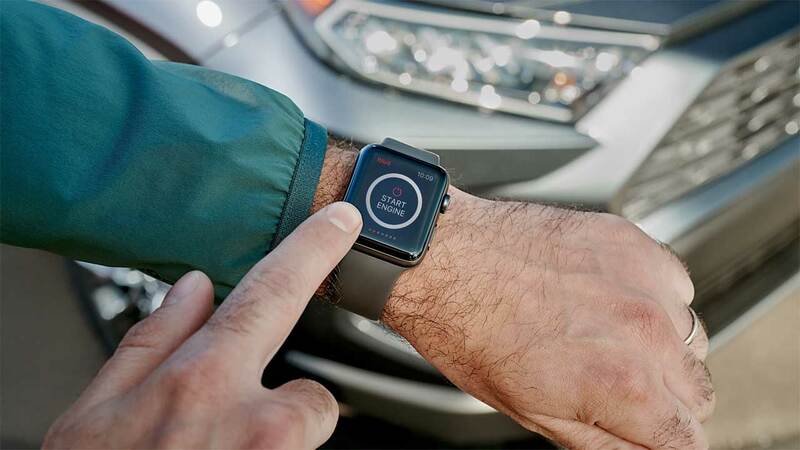 Toyota Connected Services — Safety Connect® with 3-year trial, Service Connect with 3-year trial, Remote Connect with 6-month trial, Wi-Fi Connect Powered by Verizon with up to 2GB within 6-month trial and Destination Assist Connect with 6-month trial. See toyota.com/entune for details. 2019 RAV4 Limited AWD 2.5L 4-Cyl. Interior Features: Dual zone automatic climate control system with dust and pollen filter, front center vent flow controls and rear-seat vents, Integrated panoramic backup camera with dynamic gridlines, Digital speedometer and instrumentation with analog tachometer, coolant temperature and fuel gauges; 7-in. digital Multi-Information Display (MID) with customizable settings, odometer, tripmeters, clock and outside temperature; rear-passenger seatbelt indicators, fuel economy information, trip timer, shift-position and scheduled maintenance indicators, and warning messages, Five-passenger seating with SofTex®-trimmed seating surfaces, SofTex®-trimmed heated front bucket seats; 8-way power-adjustable driver's seat with two-position memory function and lumbar support; 4-way adjustable front passenger seat with seatback pocket, 60/40 split reclining fold-flat rear seat with center armrest and cup holders, Heated front seats, Black carpet flooring with driver-side footrest, Leather-trimmed tilt/telescopic three-spoke steering wheel with silver accent and controls for audio, Multi-Information Display (MID), Bluetooth® hands-free phone and voice-command, Dynamic Radar Cruise Control (DRCC), Lane Departure Alert (LDA) and Lane Tracing Assist (LTA), Turn signal stalk with headlight controls and one-touch three-blink lane-change turn signals, Wiper control stalk with front and rear window wiper controls, Leather-trimmed shift lever with sequential mode, Soft-touch dash, door and armrests with stitched dash, door and center console accents, and anti-slip interior door grip, Dark-brown-accented interior, including dark-brown dash, door and seat stitching; and dark-brown cup holder trim and anti-slip in-dash storage trays with blue ambient lighting, Ash-gray-fabric-trimmed headliner, Silver interior door handles, Smart Key System on front doors and liftgate with Push Button Start, remote keyless entry with lock, unlock, panic and power liftgate with jam protection functions, and remote illuminated entry, Power windows with auto up/down and jam protection in all positions, Rear liftgate window defogger, Power door locks with shift-linked automatic lock/unlock feature, Digital rearview mirror with HomeLink® universal transceiver, Overhead console with maplights, sunglasses storage, Safety Connect® button and power tilt/slide moonroof controls, Sun visors with sliding extensions and illuminated vanity mirrors, Center console with covered storage compartment, two cup holders, drive mode, Multi-terrain Select, Electric Parking Brake (EPB) and automatic Brake Hold controls, and front storage tray, Passenger-side glove compartment, Height-adjustable rear cargo area deck board, Rear cargo area cover, Rear cargo area deckside-mounted storage net, Five USB ports — one USB media port in front storage tray, and four additional USB charging ports (two in front center console, and two rear-seat ports on the back of center console), One 12V/120W auxiliary power outlet in front instrument panel storage tray, and one 12V/120W auxiliary power outlet in cargo area, Front reading lights, overhead dome light and rear cargo area light, Blue ambient illumination for in-dash shelves, center console cup holders and in-front footwells, Front-row door panels with storage pockets and bottle holders, Eight total cup and bottle holders (four cup holders and four bottle holders), Automatic Electric Parking Brake (EPB) with Brake Hold feature. Exterior Features: 19-in. multi-spoke super chrome-finished alloy wheels with 235/55R19 tires, Multi-LED headlights with chrome bezels, Automatic High Beams (AHB) and auto on/off features, LED Daytime Running Lights (DRL), Integrated fog lights, LED taillights and stop lights, Dark Gray metallic-colored hexagon-patterned-bar front grille, Color-keyed upper bumper; black lower front bumper with silver valance and black overfenders; and rear bumper with metallic gray insert, Color-keyed heated power outside mirrors with turn signal and blind spot warning indicators, and folding feature, Puddle lights, Chrome-accented color-keyed outside door handles with front-row touch-sensor lock/unlock feature, Power tilt/slide moonroof with one-touch open/close, Low-profile black-painted roof rails, Height-adjustable power liftgate with jam protection, Active grille shutters, Privacy glass on all rear-side, quarter and liftgate windows, Dual chrome exhaust tips, Variable intermittent windshield wipers, Intermittent rear window wiper, Color-keyed roof-mounted shark-fin antenna.